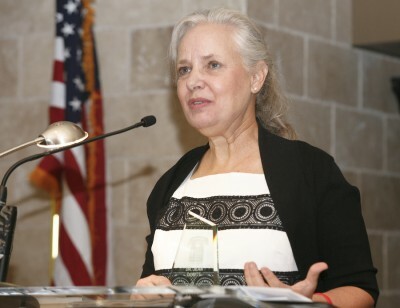 As previously reported in Skyline, Jean DeWitt, Executive Director for Global Citizenship at UHD, was selected by Crime Stoppers to receive the Leon Goldstein Award at an annual awards ceremony June 7 at the Hotel Zaza. The award is presented by Crime Stoppers to a citizen who has made a significant contribution to fighting crime in the community. According to the organization, DeWitt saw an opportunity to partner with Crime Stoppers to develop students into young leaders. She gathered a group of innovative professors to create and add a "service learning" component to specific courses and prepare students to deliver Crime Stoppers' safety presentations in the community. Her idea has resulted in the training of approximately 500 students and countless safety presentations in the Houston area. DeWitt's and UHD's commitment educates our citizens about safety, prevents crime and develops our young people to be the next generation of community leaders. The UHD faculty involved in this initiative include Judith Harris, Brittany Hibbeler, Zeenat Mitha, Bridget Mueller, Susan Osterberg, Jere Pfister and Hank Roubicek. DeWitt receives an award from Crime Stoppers Houston. Photo Courtesy of Crime Stoppers.